It feels and looks good: It's a clean design, and has a nice heft to it without being heavy. The screen is easy to read: The electronic paper has nice contrast, and the matte finish means you don't get glare in your eyes. You can adjust the size of the type: For someone who has to now use reading glasses all the time, this is a godsend. You can buy books instantly: Being able to buy books instantly from Amazon.com is a big plus. You don't need to finagle with downloading books to your PC and then remembering to transfer them to your PC. It's as pleasant as reading a book--This is a function not so much of the Kindle but of the cover I got for it. Initially, I went for the official Amazon.com cover --black leather, emblazoned with the Amazon logo--but I didn't really take to it. It had a funny smell and the back of it would flop away from the back of the Kindle. So I swallowed hard and bought another cover: the Mocha M-edge GO! Jacket for Kindle 2 . For the same price, it's ten times better. The cover is more rigid, the back of it clips securely to the Kindle, and the leather is top grade: it looks and smells gorgeous. (Trust me, I know what I'm talking about: my family used to be in the leather tanning business). The upshot is reading the Kindle is a more sensual experience than reading a mass market paperback. I love books, including the feel of them in my hand, and I was worried that the Kindle would be a diminished experience. Actually, now everything I read on the Kindle is a leatherbound book. Even the "Off" screen is fun--Rather than presenting you with a blank screen when it's off, the Kindle displays a picture of a literary great (e.g., John Steinbeck, Oscar Wilde) or a famous etching (e.g., Durer's St. Jerome in his Study). Each time you turn it off, a different picture comes up. This packaged serendipity makes the Kindle just as much fun turned off as it is turned on. The Amazon connection lets you drill into a subject--With the Kindle, you get the Amazon recommendation system on steroids. I've found--and bought--a lot of great physical books on Amazon.com due to its recommendation system. The Kindle means you don't need to wait for UPS to turn up with your book--it's instant gratification. I somehow found Stephen King's book On Writing and bought it for the Kindle--and then wandered over to Anne Lamott's Bird by Bird: Some Instructions on Writing and Life and bought it as well. So if you get engrossed in a subject, the Kindle makes it easy to find and get relevant books. The only downside is the money you spend. However, I don't want to give the impression that the Kindle 2 is all milk and honey. It could use some improvements as well. I'll blog about them in a later post. Book: "The Soul of a New Machine"
Until 1981, books about computers were written by nerds, for nerds. You know the type--"How to Get the Most Out of Your Daisy Wheel Printer." 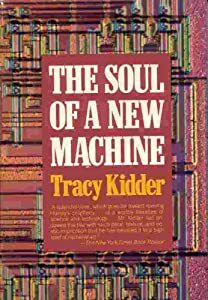 That all changed with the publication of Tracy Kidder's The Soul Of A New Machine . All of a sudden, designing a computer was a noble adventure, with all the excitement of a novel. I still remember reading the book's Prologue in the Andover Bookstore, instantly buying it, and then rushing home to finish it that night. The Soul of a New Machine is about the work and sweat involved in designing Data General's Eclipse MV/8000 (codename "Eagle") computer. At the time, Digital Equipment Corporation (DEC), Data General (DG), Prime Computer, and Wang Laboratories were selling minicomputers like hotcakes to departments who were tired of having to deal with uppity mainframe programmers. I worked at Wang Laboratories at the time--one of DG's rivals--and it was a heady time: Wang was growing faster than Google is now. You worked 12-hour days and loved it. The Soul of a New Machine captured that excitement, with all the little details that were true: Space Planning swooping in and moving the entire department (usually at the most crucial time), and warring development teams playing chicken with development schedules ("I can develop that OS in 12 months." "I can develop that OS in 10.5 months." "I can develop that OS in..."). The battle for resources was brutal. In 1981 I was working in programming, supporting Wang Manufacturing. I remember coming in one morning to see a new programmer we'd just hired from DG staring in wonder at his workstation. "It's still here!" he said. "Huh?" "It's the end of the quarter and our computer is still here!" "What's so odd about that?," I asked. "At DG, at the end of the quarter, manufacturing comes around at night, steals your computer, packages it up, and sends it out to customers so it can meet its revenue numbers." With its novelistic approach, the book influenced an entire generation of books that came after it, such as Showstopper! The Breakneck Race to Create Windows NT and the Next Generation at Microsoft and Dreaming in Code: Two Dozen Programmers, Three Years, 4,732 Bugs, and One Quest for Transcendent Software (my review of Dreaming in Code is here). While the technology described in The Soul of a New Machine is now dated, the human dynamics are not, and I still recommend it to non-technical people who want to get a feel for what it's like to work in the computer industry. Prompted by Peter O'Kelly's blog post, I bought Inside Steve's Brain by Leander Kahney and gave it a read. As Peter notes, it's a quick read even though it's 294 pages long, due to both the writing style and the book's small form factor (7 1/4" tall by 5 1/2" wide). Inventive Spirit: Where Does the Innovation Come From? The high tech world has long been populated with companies that are organizational manifestations of their founders: DEC (Ken Olsen), Wang Laboratories (An Wang), Microsoft (Bill Gates), Apple (Steve Jobs), Oracle (Larry Ellison), and Salesforce.com (Marc Benioff). Having worked at one (Wang Laboratories) for many years (17), the value you get from a founder's unified vision can't be underestimated. Employees understand how to behave and what to do based on passed around stories about the founder's behavior. It's a tribal thing--something sort of primeval and messy that's not always acknowledged in this digital world focused on "facts"--that is nevertheless very powerful. So I was interested to read about Steve Jobs' view of the world and the stories that instantiate it, and I was not disappointed. I think the book could have used some pruning here and there--from time to time the book makes the same point over and over--but all in all a pleasant read that passes along some insights in a painless way. Initially, the title of this book--"The Box"--leaves you hanging: "Hmm, is this about product packaging? Is it about some Claus Oldenburg sculpture that I don't know about?". However, it all becomes clear when you read its subtitle: "How the Shipping Container Made the World Smaller and the World Economy Bigger." Written by Marc Levinson in 2006, the book went on to become a minor classic, being short-listed for the 2006 Financial Times/Goldman Sachs Business Book of the year and winning the 2007 Anderson Medal from the Society for Nautical Research. It argues that the creation of the standardized shipping container played a major role in driving down global shipping costs and increasing shipping speed--or, as The Economist puts it, "Without the container, there would be no globalization." And, by the end of the book, you're absolutely convinced that that's true. By drawing on a variety of disciplines--economics, business history, maritime history, and regional planning--and peppering the story with biographical vignettes, Levinson offers a highly readable account of how shipping containers have made $7 T-shirts from China a commonplace thing. The catalyst for this change was a maverick named Malcolm McLean, a trucking company owner who won business by monitoring and cutting costs, a rarity in a business run more by rule of thumb in the 1940's and 50's. McLean Trucking was the first major trucking company to use diesel engines in its trucks; to keep insurance costs and repair bills to a minimum, the company had senior drivers train new drivers, and if the new driver made it through the first year without an accident, the senior driver received a bonus of one month's salary. In the early 1950's, McLean was worried that his coastal trucking business would suffer from competition from shipping lines, so he put in motion a plan to buy his own ships and set up terminals that would quickly transfer truck trailers to and from the ships. However, it was easier said than done: such tight integration between trucking companies and shipping lines was in direct violation of the Interstate Commerce Commission's rules at the time. Nevertheless, McLean soldiered on, using a variety of legal machinations to get around the ICC rules and depending on an up-and-coming banker (Walter Wriston, who eventually went on to run Citibank) to loan him money. Book: "Revolution in the Valley"
About two years ago I read Andy Hertzfeld's book, Revolution in the Valley: The Insanely Great Story of How the Mac Was Made , and I recently riffled through it again. It's a collection of stories about the early days at Apple Computer--in other words, the world before Apple had cool stores and before the company lopped "Computer" off of its official name. The book started out as a set of posts on www.folklore.org--and in fact you can still read the book online if you want to--but I must admit I find it easier to take a book to bed than a laptop. It's a lot of fun--the book captures the everyday chaos in a fast-growing computer company--and helps explain that not all business success is predicated on well-trained employees following a vetted business plan. Passion, knowledge, serendipity, long hours, and luck all play a part. Dreaming in Code is one of those books about the ups and downs of a software project. Tracy Kidder's The Soul of a New Machine (1981) created the genre, and in my view it has never been equaled. Scott Rosenberg is an equally gifted writer--his explanation of Python and its place in the programming universe (pages 70-79) is masterful--but he picked a dud project. Dreaming in Code is about building a new personal information manager code-named Chandler. Famous folks in the programming community turn up in the story from time to time--Mitch Kapor (creator of Lotus 1-2-3), Andy Hertzfeld (an early Mac programmer), and Lou Montulli (co-founder of Netscape)--but their experience and contacts were still not enough to make Chandler a success. Design began in the spring of 2002. With the powerful Lotus Agenda as a historical rev 1.0 (however, Microsoft's Outlook cleaned its clock in the marketplace), Chandler was going to be a new rev 2.0. Besides helping users manage their e-mails, appointments, contacts, tasks, and notes in a very hyperlinking kind of way, Chandler would be cross-platform, running on the Windows, Mac, and Linux OSs. However, the project never really got off the ground, and it was scaled back in January of this year. So if you want to get a feel for what's it's like to work on a struggling software project, read Dreaming in Code . It's interesting, but depressing. Book: "A Short History of Financial Euphoria"
As we head into a recession, a good book to remind you that this has all happened before is John Kenneth Galbraith's A Short History of Financial Euphoria . The title is correct--the book is short: 113 pages. Some artifact or some development, seemingly new and desirable--tulips in Holland, gold in Louisiana, real estate in Florida, the superb economic designs of Ronald Reagan--captures the financial mind or perhaps, more accurately, what so passes. The price of the object of speculation goes up. Securities, land, objets d'art, and other property, when bought today, are worth more tomorrow. This increase and the prospect attract new buyers; the new buyers assure a further increase. Yet more are attracted; yet more buy; the increase continues. The speculation building on itself provides its own momentum. This process, once it is recognized, is clearly evident, and especially so after the fact. So also, if more subjectively, are the basic attitudes of the participants. These take two forms. There are those who are persuaded that some new price-enhancing circumstance is in control, and they expect the market to stay up and go up, perhaps indefinitely. It is adjusting to a new situation, a new world of greatly, even infinitely increasing returns and resulting values. Then there are those, superficially more astute and generally fewer in number, who perceive or believe themselves to perceive the speculative mood of the moment. They are to ride the upward wave; their particular genius, they are convinced, will allow them to get out before the speculation runs its course. And then, of course, the crash comes. If you're a bit weak on economic history and want to brush up, Galbraith gives capsule histories of some of the great boom-and-bust episodes: the tulipmania in Holland in the 1630's, the Bank Royale scandal in the early 1700's, and the Crash of 1929. A quick and enjoyable read from a famous economist, while at the same time a bit unsettling: "We should have seen it coming...."
Peripheral Vision: Detecting the Weak Signals That Will Make or Break Your Company , talks about how to watch the periphery so you aren't blindsided by changes in customer behavior or a new competitor in an adjacent market. The authors are George Day (Wharton bio; Professor of Marketing and Codirector of the Mack Center for Technological Innovation at Wharton) and Paul Schoemaker (Wharton bio; Research Director at the Mack Center for Technological Innovation at Wharton and Chairman of Decision Strategies International). Book: "Technological Revolutions and Financial Capital"
This book--Technological Revolutions and Financial Capital by Carlota Perez--will change your view of the high tech world. I would put it on a par with Alfred Chandler's The Visible Hand and Thomas Kuhn's The Structure of Scientific Revolutions --high praise indeed. The author reviews previous high tech revolutions (Industrial Revolution, Age of Steam and Railways, Age of Steel, and the Age of Mass Production) and maps them to the current revolution: the Age of Information and Telecommunications. She comes to two major conclusions. First, all such revolutions demand financial capital and often new ways of procuring it (in the high tech revolution the new means was venture capital). People and institutions get tired of low returns from current technology and start looking for new ways to get a higher return. These groups, by funding emerging technologies, make the early stages of a technological revolution possible. Second, these revolutions play out in 60-year intervals. The first half of the interval is Installation; the second half is Deployment. Installation contains two phases: Irruption and Frenzy, punctuated at the end with some kind of turning point--the Panic of 1847, the stock market crash of 1929, the dot.com implosion in 2000. At this point, Deployment takes over, again in two stages: Synergy and Maturity. Towards the end, returns start to dwindle, and financial institutions once again start looking for the next technological green field. According to Perez, we are now in the Synergy stage. Some hallmarks of the era are "making the products truly user friendly and mutually supported" and "speed, reliability, quality and cost reductions receive special attention." Sound familiar? Read the book and get a glimpse of what's coming. I'm currently in Portland, OR and spent several hours yesterday in Powell's Books. It bills itself as "the largest independent used and new bookstore in the world," and it's easy to see why. It takes up an entire city block and is reminiscent of the large bookstores along Shaftsbury Avenue in London. You know, the ones that have acres of books from top to bottom that go on for rooms and rooms. I overheard a wife yesterday say to her husband, "Let's stick together. I've worried if we get separated that we'll never find each other again." The selection is impressive. For example, Powell's has an entire bookcase, top to bottom, devoted to "Military Aviation." You'd be hard pressed to even find a bookshelf so labeled in a Barnes & Noble or a Borders bookstore. Definitely worth a visit if you love to read and are in the Portland area. Book: "In Search of Stupidity"
Merrill Chapman's book, In Search of Stupidity: Over 20 Years of High-Tech Marketing Disasters, is a guilty pleasure. Chapman has tiptoed through the tulips of high tech over the years -- he was a group product manager of WordStar at MicroPro, product manager at Ashton-Tate, and a consultant to Microsoft, Novell, Teradata, and others. The book is his recounting of high-tech marketing disasters he was involved with, as well as others, such as Microsoft vs. Netscape. It's funny in parts -- and having worked in high tech for 30 years, all too accurate -- but it's also snarky. In retelling the stories, Chapman often comes across as the only bright one in the room -- everyone else makes mistakes he avoids. Part of this comes from hindsight -- how things were going to play out were not apparent at the time. Consequently, Chapman's judgments get shakier the closer he gets to today. For example, he disses Software as a Service after the dot.com bust, but doesn't predict its current resurgence. In short, a funny read that needs to be taken with a grain of salt. Boy, I miss the SoftPro Bookstore. For techies who live on Boston's North Shore, it was a great place to go to get books on cutting edge tech subjects: software, hardware, Linux, programming languages, board design, you name it. For a number of years it was based in Burlington, MA, right across from the Burlington Mall. It was dedicated solely to high tech subjects, and the staff was stable, so you could go in and say, "I need a good introduction to Linux," and staffer would reply, "Well, we have three that fit that bill. What OS's are you used to? One is good if you're coming from Windows, and the other two are better if you have a Unix background." Programmers from out of town would come into the bookstore -- often because they were attending a course at a nearby tech company -- and literally salivate. I remember watching a fellow from Montana buy $400 worth of books, pointing out, "We sure don't have bookstores like this out in Montana."